Molded-in wave baffles reduce wave motion, resulting in 40% less splashing for safer, cleaner, more efficient mopping. Heavy-duty, ergonomic wringer designed to exceed 50,000 cycles. Mop handle secures during transport, preventing damage to walls. 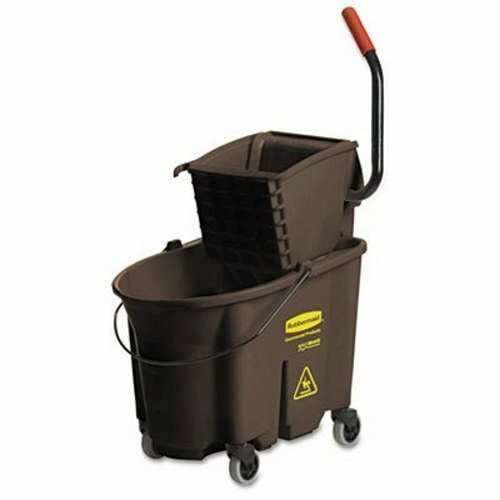 Accepts Rubbermaid Commercial 9C74RED Dirty Water Bucket (sold separately). Nonmarking 3 casters. Constructed of tubular steel and structural web molded plastic. For general mopping jobs. Accepts Dirty Water Bucket. Accommodates 12- to 32-oz. mop heads. Capacity Range (Volume): 26 qt; Capacity Range (Volume) [Max]: 35 qt; ; Depth: 23 1/8. ~ Includes one bucket and one wringer. ~ For general mopping jobs. Accepts Dirty Water Bucket. Accommodates 12- to 32-oz. mop heads.